The loss of Bob Marley and John Lennon within 6 months of each other in the early '80s stained the decade, leaving a hard to overestimate musical vacuum. On December 8th, 1980 when word arrived that Lennon had been shot many of Marley's biggest Bay Area fans were on their way to a Stevie Wonder concert which had been originally scheduled to feature Bob Marley and the Wailers until it was postponed after Bob collapsed while jogging in New York's Central Park earlier that Fall. All too true rumors had circulating since October of 1980 that Marley had been diagnosed as having cancer and less than a few months to live. Nobody wanted to believe it, least of all Bob. Stevie Wonder's reggae masterpiece and tribute to Bob Marley, "Masterblaster (Jammin')" came out in September stormin' the charts, looking tailor made for Marley's proposed tour with Wonder where, hope of hopes, Stevie and Bob could sing Marley's "Jammin" and "Masterblaster" together. Finally, it was also hoped, Marley would gain the exposure to reach the successes he'd just enjoyed world-wide that year breaking attendance records set by The Beatles, Led Zeppelin, Abba and others with crowds of over 100,000 in places like Italy and Germany. Now with Marley in death (May 11, 1981) even better known and appreciated in the states, with his son Ziggy getting so much attention that it seems almost in reparation for the neglect accorded his father, Island Records has quietly, and assuredly assembled their entire Bob Marley solo career catalog from the crucial 1974-1980 period onto eleven glorious cd's including two compilations. The timing couldn't be better. To discover this visionary country rasta turned natural mystic and Reggae King can be enough of a pick-up, but when Robert Nesta Marley's musical legacy, the eleven scrolls if you will, are revealed in all Jah glory through the digital dread process of laser hi-tech, pity the weak heart. After two LP's with the Wailers, Peter Tosh and Bunny Wailer, CATCH A FIRE and BURNIN, which internationalized real roots reggae once and for all, Bob Marley released an album a year from 1974 through 1980. Then 3 posthumous compilations were issued including CONFRONTATION which was made up of new and previously unreleased on Island tracks. While Lennon watched the wheels for 5 years of domestic bliss, Marley was hard at work, constantly on tour or preparing albums that were the perfect antidote to a decade where rock and roll began to more resemble Big Time Wrestling than the thunder rebel reality that Bob projected. Now with both artists' oeuvre gaining renewed interest in the new compacted format perhaps another generation will get inspired as much as say U2's Bono who recently called Bob Marley his biggest influence, the artist who made him determined to create new and socially aware music. Even Island Records head Chris Blackwell during the label's 25th Anniversary Special hailed Bob as the company's finest achievement, which when you look at Island's roster ranks Bob among some impressive company. Like some I was a bit skeptical about how reggae would sound on cd, but when I heard the clarity and feeling of Bob's "Redemption Song" off the LEGEND compilation where he accompanies himself only with acoustic guitar I was so bowled over I couldn't wait to hear the rest of his works. If a simple folk song sounded so different, so great, just imagine what the fullness must reveal. There were no disappointments. Though drum and bass form the foundation of reggae with thunderous bass perhaps its most recognized element all of Bob's US albums were re-EQed with some of the bass rolled off to supposedly become more accessible to American ears. So it was with some trepidation that I compared the bass on Marley's UK box set with his US LPs and cds. While the old phono needle seem to roll out more bass on the UK albums, it tends to muddy up the rest of the mix. Not so with cds. The bass is still tough but tighter, leaving room for delightful subtle ambiances and beginning with Bob's 1976 RASTAMAN VIBRATION its prominence and amplitude seems about right Another remarkable discovery I made while going through the Marley cds was how much subtlety can be discerned even at low volume. After years of turning it up straining to hear all the intricacies masking each other on vinyl, what a pleasure to actually turn it down and here more is quite a surprise. Then when under 'Dreadphones', one can become like a fly on the wall during the studio sessions with Marley's magic holding one spell-bound. Marley's first solo album NATTY DREAD was released in 1974 when Bob was in the midst of reinventing his sound after ten years of work with Peter Tosh and Bunny Wailer. With all 3 Wailers beginning solo careers Bob enlisted the crucial background vocals of Jamaica's 3 finest female singers, his wife Rita joined by Judy Mowatt & Marcia Griffiths and dubbed the I-Threes, while retaining the killer rhythm section with the Barrett Brothers, Carlton and Aston 'Family Man' on the drums and bass respectively. NATTY DREAD broke new ground while proving Marley's pre-eminence in Reggae. Filled with tunes like "Lively Up Yourself", "No Woman No Cry", and "Rebel Music" NATTY DREAD garnered significant air-play during FM's waning halcyon days and even made the wearing of the natural black hairstyle, dreadlocks, fashionable in Jamaica and abroad. On cd the tasteful guitar picking of Al Anderson almost sounds acoustic while the harmonica riffs bounce and slice through the mix. You can even hear Bob drawing on his spliff from time to time and on "Rebel Music " one can nearly make out additional lyrics and vocals that were wiped off the mix to make room for instrumental passages. By the time Bob sings "Never make a politician grant you a favor, they will always want to control you forever" on the closing track "Revolution" there is no doubt that you're witnessing the birth of a new stage in the 20th century's evolution of popular music. The spirit of Jamaica's Maroons, unconquered slaves who fled to the island's Blue Mountains on arrival, lives through Marley's seductive heartbeat paced songs that draw from Biblical/African sources and axioms that stretch forward for over 4,000 years of human experience. Hence Marley and other Rastafarians' belief in Ethiopia's Emperor Haille Selassie, who when crowned King of Kings in 1930 became a symbol to all displaced Africans of the eventual restoration and unification of Africa. And with the Selassie's lineage directly linked to King David, Reggae's world-wide spread, thanks to Marley, became a vehicle of expression for oppressed peoples everywhere. From Native Americans like the Havasupi in the bottom of the Grand Canyon to remote Saharan outposts Bob Marley and his message are more known than any other music figure. The historic significance and moral authority of Marley's Reggae tends to make most rock and pop appear frivolous. After all, how are we gonna have "fun, fun, fun" now that Big Daddy took the ozone away? By 1975 Bob Marley & the revamped Wailers' stock had risen quickly due in part to the success of NATTY DREAD and a strong touring presentation that created the first and greatest sensation abroad when Bob played London's Lyceum to turn away crowds and overwhelming media excitement in July. To ride that momentum and to capture the buzz Island rushed BOB MARLEY AND THE WAILERS LIVE (from the Lyceum's July 17th show) to retailers. With the opening "Trenchtown Rock" ("One good thing about music, when it hit's you feel no pain") taken from Bob's earlier years when the three Wailers worked with Lee Perry, Marley had to pull from more than just his one solo LP to fill up a concert so this cd includes crucial live versions of original Wailers' classics from BURNIN "Burnin' and Lootin'", "I Shot the Sheriff", and Bob's signature tune that he co-wrote with Peter Tosh, "Get Up Stand Up" with Marley doing his "Woy, Yoys" for the first time ever at the Lyceum. On the cd the electricity in the air is visceral. RASTAMAN VIBRATION, released in 1976 and Bob's second solo effort, became Marley's biggest selling US LP ever, making Billboards Top Ten Album list that summer after a publicity blitz. Marley made the cover of Rolling Stone as the "Rasta Man with a Bullet" ironically foreshadowing the attempt on his life at his home in Kingston that December which was also presaged on the liner notes for RASTAMAN VIBRATION under the heading "The Blessing of Joseph" quoting Genesis where "the archers have sorely grieved him, and shot at him". From "Positive Vibration" until the final "Rat Race" the RASTAMAN VIBRATION cd sparkles with better studio techniques and important new members of the band like Tyron Downie on keyboards, Seeco Patterson on percussion, Earl "Chinna" Smith and Donald Kinsey on rhythm and lead guitars. Bob uncorks two rippin' reworks of Wailers' standards "Cry To Me" and "Who The Cap Fit", designs "Roots, Rock, Reggae" for some radio play, follows up "No Woman, No Cry" with "Johnny Was", and creates 4 new standards that immediately became part of his touring repertoire including "Crazy Bald Head" and the massive show stopping anthem "War" with the lyrics all from Haille Sellassie's UN speech, that in part condemned apartheid with impossible to forget lines like, "until the color of a man's skin is of no more significance than the color of his eyes... there'll be war." Wow. By that time Bob was so big in Jamaica that rival politicians were trying to grant him favors and gain his support. '76 was an election year on the island so Marley put out a local single, "Smile Jamaica" to help cool out the expected violence and before it was over both parties tried to co-op Bob which led to the attempt on his life December 3rd at his new 'uptown dread' home at 56 Hope Road. A few days later, after heroically performing at the uneasy Smile Jamaica concert in bandages Marley fled to England where he remained for the next year and a half. This is where he met Junior Marvin and recorded two LPs that sound absolutely gorgeous on cd, EXODUS and KAYA. though both were recorded at the same time. EXODUS was issued in '77, about a year before KAYA . 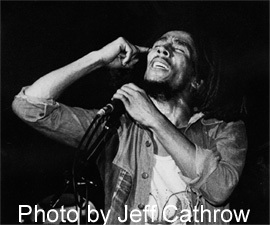 EXODUS' movement of Jah People, as the title intimates, marked another turning point in Marley's career. Obviously his escape from death and Jamaica had deeply affected him. Now he was the Proverbial Bob Marley, the Joseph here to shepherd the flock, the Moses to lead the chosen out of Babylon, so on EXODUS the first five tracks all relate to those themes and the assassination attempt. On cd the 30 second opening fade-in on the albums' opener "Natural Mystic " is even more ominous as it emerges clean from total silence with Marley singing "things are not the way they used to be". "So Much Things to Say" refers to the ridiculous rumors viciously spread about motives behind the shooting. "Guiltiness" lets Marley point the finger . "The Heathen" gets the rod of correction and "Exodus", which got some decent air-play in '77's disco era, finds Marley warning that Jah (God) is coming to "break down downpression, rule equality, wipe away transgression, and set the captives free." The five final cuts include four all-time classics, "Jammin'", "One Love","Three Little Birds " and one of the greatest love songs ever written, "Waiting In Vain". The sweetness of these shimmer bright from the UK studio on cd and set the stage for KAYA's mellower tone. KAYA is the biggest surprise of the cd digital dread Marley. Widely underrated in 1978, on compact disc KAYA packs a wallop. The richness of tunes like "Is This Love" (the most widely covered Marley song ever), "Sun is Shining", which along with KAYA and "Satisfy My Soul" are old Wailers' gems redreaded. "Misty Morning", "She's Gone", "Running Away" and others cannot be denied in the big broad reproduction stylee. Marley returned to Kingston in April '78 to headline the One Love Peace Concert where he joined together the rival politicians on stage with the ghetto ganglords in a show of unity for which Bob was eventually awarded a UN Peace Medal. He also began to attract stadiums size crowds and an amazing double record set of live shows taped in Paris, Copenhagen and London BABYLON BY BUS sent Rolling Stone into a frenzy calling the LPs the "greatest live rock and roll album ever made" and the "ultimate party record." Island has squeezed the 70 minutes plus Marley live onto one monster cd that plays straight through so you are really at an actual concert. Jahsome! Back at 56 Hope Road. Marley's Tuff Gong studios were upgraded where Bob cooked up his finest and last two albums as the 70's drew to a close. '79's SURVIVAL and the '80's UPRISING are full strength Bob, recorded at the highest quality at his peak even at a time when he was painfully aware of his own mortality. Comfortable with a world class studio in the very house where he'd been shot and still slept, Marley set about to create, first SURVIVAL, a ten chapter scroll pleading for a United Africa. On cd "Ambush In the Night", a stark reference to guess what, leads directly into "So Much Trouble In the World" literally keeping the record on track unlike the vinyl version. The opening "Wake Up and Live" keeps up the long time upfull themes of "Lively Up Yourself", "Get Up Stand Up", "Stir It Up" and "Mix Up" - always UP! Were talking SURVIVAL! Hear "Zimbabwe". It so inspired the Freedom Fighters there that when Rhodesia became Zimbabwe in 1980 they invited Bob to play at the ceremony where Prince Charles took down the Union Jack. Check "Babylon System", a subtle ballad that stems with indignation and brutal truth. On cd, it nearly implodes with impugned integrity. When I first heard Bob was terminally ill I immediately listened to UPRISING on headphones. It had been out for a couple months. By the closing notes I was in tears. The rumors were true. Nearly every track alluded to it. Listening to the cds is a bit like having on headphones in the open air. UPRISING's sessions must have been phenomenal. Many great (and uncredited) reggae artists came in and sang along. Bob at least suspected this may be his final work. The sense of urgency and yet easiness present here is unique for Marley. UPRISING begins with "Coming In From The Cold" and ends in the mind blowing, only Marley folk tune "Redemption Song" with Bob on the cover being reborn from the earth, dreads firmly rooting about to break free for the ultimate liberation. LEGEND is the primer as far as the Marley cd compilations. REBEL MUSIC is the first testament with a couple remixes of Bob's conscious catalog including the rare, killer "Roots". CONFRONTATION is more of a reconstituted Marley album taken from an amazingly large collection of unreleased tapes and Jamaican singles. A couple of all dub cd's could be winners too. Imagine.